Project Open Hearts, a non-profit organization based in Denver, Colorado, works with foreign medical staff to provide first-hand surgical training, assistance with diagnostic procedures and consultations, support for orphaned children and needy families, and on-going exchange of knowledge to continue the education process. The goal is self sufficiency for all medical programs initiated. The Project Open Hearts Appreciation and Recognition Dinner was held on September 30th, 2006 at the Trinity Grille in Denver, Colorado. Project Open Hearts, a 501(c)(3) medical humanitarian organization, has provided specialized cardiac and cardiology services to many countries since 1994. Along with the medical services, donations for orphanages and needy families in all countries have also been a focus. Past recipient countries include Tanzania, Kenya, Kazakhstan, Mongolia, Kyrgyzstan, Uzbekistan, the Middle East, and Poland. Currently, the programs are focused on cardiac services in Tanzania and Mongolia. Our current orphanage project is outside of Nairobi, Kenya, at Tumaini (Hope). We are assisting with the on-site medical clinic for the children and other needs identified by the staff. As a private non-profit, we are completely dependent on your generous support and donations to continue our global outreach programs. Our goal each year is to provide as many services to as many patients and families as possible, with minimal overhead. As a completely volunteer organization, each dollar raised goes directly to programs and to maintain the non-profit status. Thank you for making it possible to share our knowledge, skill, and recycled medical supplies with those less fortunate. In February 2006, Project Open Hearts returned to the Tanzania Heart Institute to continue the cardiac training program started in 2004. The Tanzania Heart Institute is a non-profit organization dedicated for the treatment of heart, blood vessels, chest and related diseases through innovative and progressive programs in research, education and patient care in Tanzania. The institute provides valuable services to improve the health care and education to Tanzania and to the East African people at large. 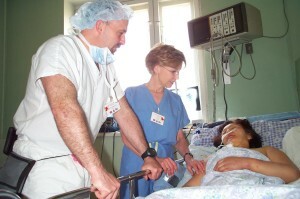 The Project Open Hearts overseas medical volunteer teams during 2006 will include a cardiac surgeon, cardiologist, anesthesiologists, perfusionist, OR scrub nurses, ICU nurses and biomedical equipment technicians. Rita Lenz and Dr. Tom Pezzella have been appointed to serve as a Members of the Board of Directors of the Tanzania Heart Institute for three years effective from June 1, 2004 to May 31, 2007. Rita Lenz is the Founder and Director of Project Open Hearts. Dr. Thomas Pezzella is the President and CEO of the World Heart Foundation and the International Children's Heart Fund, and also has served as a Project Open Hearts volunteer. Project Open Hearts is looking for volunteers for our future missions to fill out specialized teams in adult and pediatric cardiac surgery. Anesthesiologists, perfusionists, cardiologists, and OB-GYN doctors and nurses are always needed.